Sammy Donnelly is pleased with how things are progressing as Shoreham Football Club continue preparations for a season back at Southern Combination League level. Mussels returned for pre-season training earlier this month in a bid to put behind them what proved to be a campaign to forget last term. Having worked so hard to reach Bostik League level for the first time in the club’s history, they were relegated and dropped back down to the SCFL Premier Division. Shoreham have stuck by experienced boss Donnelly, announcing he would remain as manager for the 2018/19 season even before the club’s Bostik League South relegation was confirmed. Goalkeeper James Broadbent and talented youth duo Alfie Proto-Gates and Nick Collyer had agreed on stays prior to the close season, while Ross Myers and Josh Gould will also be remaining at the club. Donnelly has also moved to make his first signing of the summer, with youngster Michael McCormick joining from Newhaven. Forward McCormick made a number of appearances for Dockers’ under-23 team and featured on the odd occasion for the club’s first team. Shoreham boss Donnelly revealed he’s in discussions with more players and hopes more deals will be completed in the coming weeks. 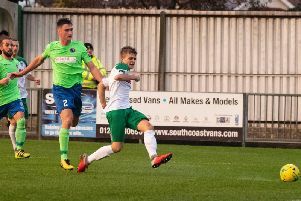 Having bolstered Mussels’ frontline for the new season by bringing in McCormick, Donnelly is keen to further strengthen in that area. “I’ve been talking to another striker with a view to him joining the club. Shoreham and Donnelly will be eager to show what they are capable of after what proved to be one of the toughest seasons for the Middle Road outfit. Mussels managed to pick up just three wins over the whole campaign and, with a six-point deduction for ‘registration irregularity’ to take in to account, they collected just eight points across the season. Shoreham have an exciting young crop of players coming through at the club, something Donnelly is keen to tap in to. The hope is a healthy mix of youth and experience will see Mussels enjoy more success on the field over the 2018/19 season. Shoreham’s pre-season friendly programme starts at Steyning Town on Saturday, July 7.